On March 19, 2013, owners of real property in Washington, DC, gained access to a useful estate planning tool: the transfer on death deed (TODD). 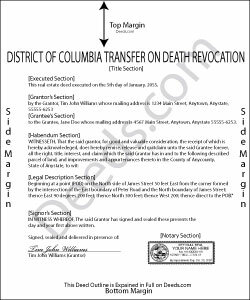 Modeled after the Uniform Real Property Transfer on Death Act (URPTODA) and located at D.C. Code 19-604.01 et seq (2013), this statute governs the use of transfer on death deeds in the District of Columbia. Because life's circumstances can change quickly, it's important to establish an estate plan and to keep it up-to-date. Transfer on death deeds deal with the disposition of what is often one of people's largest assets, their real estate. Most real estate deeds involve permanent, and frequently immediate, transfers of ownership from the old owner to the new one. What makes TODDs so unique is the option to revoke them ( 19-604.06). Using the rules set forth in 19-604.11, property owners who previously recorded a TODD may revoke, change, or otherwise modify their earlier plans with no penalty. There are three basic methods for revocation: executing and recording (1) a new TODD that revokes all or part of the recorded TODD; (2) an "instrument of revocation that expressly revokes the deed or part of the deed" -- a specific revocation form; or (3) an "inter vivos deed that expressly revokes the transfer on death deed or part of the deed." As with the TODD itself, the revocation must be executed and recorded while the owner is alive and competent to make such decisions ( 19-604.08).